Jewelry is an investment of not only money, but time, patience and love. When properly cleaned and polished, jewelry maintains its value and draws the eye. Protect your jewelry-making supplies and finished pieces with this handy list of dos and don'ts. ... clean jewelry-making components and finished jewelry regularly. Keeping components and finished jewelry clean of tarnish, body oils, cosmetics and perfume residue extends the life of the piece and prevents chemical damage to the materials--especially soft stones such as turquoise and amber. ODX Degreaser and Glitz Jewelry Shiner are ideal organic-based cleaners for most jewelry. ... dry jewelry-making components and finished jewelry with old, soft cotton or linen cloths after cleaning. New fabric contains starches or sizing to stiffen it and can scratch jewelry and plated finishes. Use linen or cotton (wool can scratch). Allowing components or jewelry to air dry can leave spots on the surface, especially if cleaned with hard water. ... have expensive or sentimental pieces of jewelry checked every few years by a professional jeweler. A professional will be able to determine if stones are loose or settings are wearing down. ... wear finished metal jewelry pieces often. Wearing jewelry prevents the buildup of tarnish, as contact with the skin rubs off tarnish as it's created. ... polish and maintain sterling silver. Even antiqued sterling silver will develop a patina that deepens its luster and improves the way it looks. 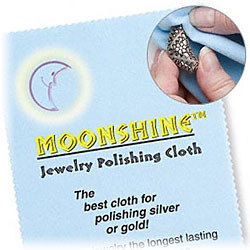 You can find jewelry cleaners and polishers which do not remove antiquing or blackening effects, such as the Moonshine® Polishing Cloth. 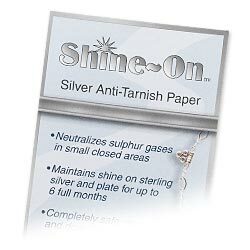 Store with Shine-On™ anti-tarnish strips to decrease the repolishing necessary to maintain sterling silver. ... store and display jewelry components and finished pieces individually, in separate boxes or fabric bags. Hang pendants and finished necklaces on jewelry displays to prevent pieces from rubbing against each other. Metal jewelry components can scratch and mar not only each other, but also gemstone components. Jewelry components or finished pieces which are scratched, dented or gouged lose their value and eye-appeal. ... store and display diamonds carefully in separate boxes or fabric bags. Diamonds are the hardest substance on the planet, yet they can be split like a log with a sharp blow on the wrong surface. Diamonds can scratch and split each other, so wrap them carefully and store pieces separately. (It is said that the Taylor-Burton diamond worn by Elizabeth Taylor had to be recut because she put it on the dresser and the diamonds scratched one another.) Diamonds will also scratch softer gemstones--and that's every other gemstone on the planet. ... store and display silver and copper in a dry environment. Moisture causes tarnish and corrosion, so be careful with uninsulated window displays. For private use, don't store jewelry in the bathroom (regardless of how convenient it is). ... put jewelry on after make-up, perfume, lotions and hairspray are already done. This is especially important for stones such as pearl, turquoise and amber, as they are very absorbent. Metal components can also react with skin oils, hand lotions and sanitizers. ... polish your sentimental and fine jewelry as well as your high quality components with a clean polishing cloth every time. A used cloth contains tiny pieces of dirt that can scratch the component or finished piece, especially plated finishes. 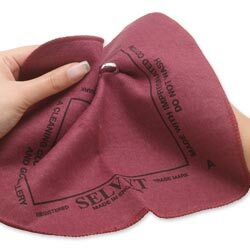 Be sure to choose an appropriate polishing cloth. ... remove jewelry if you are going to be physically active and likely to perspire. The cord will absorb the salt and odor of perspiration. Metal and gemstone components can react to the salts and acids in perspiration. 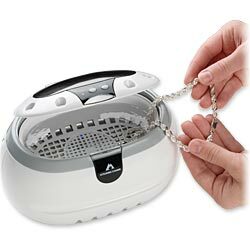 ... check components and finished jewelry for loose gemstones before using a liquid jewelry cleaning dip, steam cleaner or ultrasonic cleaner. Check each stone setting afterwards for missing stones. Loose stones, especially diamonds, can be hard to see in the bottom of containers of liquid. ... wear pearls over areas with freshly applied lotion or perfume (especially those with citrus scents). The citric acid in these scents can eat away at pearls, especially if put away without cleaning. ... store silver jewelry components or finished pieces directly on wood surfaces. Woods frequently contain acids that react to the metal and cause discoloration and tarnish. ... put stainless steel and silver items into water together. The silver will turn black - wash different metals individually to prevent reactions. ... get jewelry metal polish compounds on any gemstones used in the piece. Cleaners and polishers used for metals can damage gemstones. ... wash pearls in hot water. Ever. Natural body oils will keep pearls looking their best, so wear pearls often to maintain their beauty. If they are dirty, use cleaning and polishing materials designed just for pearls. 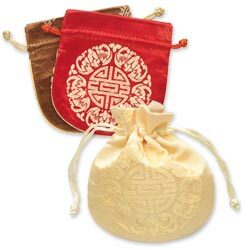 ... store pearls or opals in sealed zip-top plastic bags. Both stones are sensitive to changes in humidity. Condensation will form inside the plastic and damage the stones. Use soft fabric bags to store jewelry. ... forget to protect your clothes, your eyes and workspace when using jewelry cleaning and polishing materials. 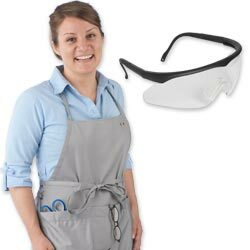 Follow directions and safety precautions to prevent stains or damage to you, your attire and your workspace - especially when using liquids or creams. ... wear rubber or latex gloves when handling silver jewelry components or finished jewelry. Since rubber or latex gloves can contain tarnish-causing sulfur, wear soft cotton gloves instead. Latex-free vinyl gloves are suitable for protecting your hands from tarnish removers or polishing compound, and are usually safe for handling most jewelry pieces. For long-term jewelry handling, soft cotton gloves are ideal. ... clean jewelry with toothpaste or with powder cleansers that are used on bathroom porcelain. Even the ''scratch-free'' varieties can leave marks on soft silver or gemstones. Pour boiling water over a soft, old toothbrush before adapting it to clean jewelry, in order to remove any particles of toothpaste left in the bristles. Allow to cool before using. ... store silver or copper components or finished jewelry without removing skin oils and perspiration from them. Wipe each piece gently with a Moonshine® Polishing Cloth before individually storing. ... scrub silver pieces, even to remove tarnish, since silver is a soft metal. When tarnish is removed from silver, a thin layer of the silver itself comes with it. Use a gentle, circular motion to polish silver and be especially careful when polishing silver-plated jewelry or components.